I’ve been real quiet lately, I know. But I have a good excuse. No, a great excuse. I must have forgotten ab0ut *work* when I formulated those thoughts. My company closed for the entire week of Succos, which is very nice on Succos. Then we all came back, and the reality hits. It’s not like one person going on vacation, when you are the only one out, and everyone else’s work (hopefully) gets done. In this case, the entire company was out. We came back to over a week of backlog. Difficult, draining, exhausting…these words don’t begin to describe what it’s like to come back to the office to find hundreds of emails in your inbox. And don’t get me started on the phone calls. Suffice it to say, every day (including Sunday, when I went in to catch up a bit) I came home from work and collapsed. Food? Who can eat when you are that tired? The mere thought of typing up this post tired me out. But here I am, typing this post. Mostly because so many people have told me they are looking to tighten up on their diets, try to lose some weight. If anyone knows how tough that is, I do. I have lost a lot of weight, and continue to diet and (hopefully) lose weight. A specific request that I have gotten from friends and readers is for diet snacks. My first reaction is: You want diet snacks? If you are on a diet, don’t snack. That’s diet snacks. But that’s not necessarily realistic. We’re human. We enjoy snacks. And sometimes, we enjoy snacks that aren’t carrot sticks or an apple. That’s where this recipe comes in. My favorite snack is popcorn, but I find it not very filling. This recipe is kind of like a more filling version of barbecued popcorn. And the best part? It’s ridiculously easy, either as a quick and healthy snack or a delicious side dish. In a large mixing bowl (or if you are lazy, like me, do this right on the lines tray!) mix together all ingredients. Spread in a single layer (or as close as you can get) on the tray. 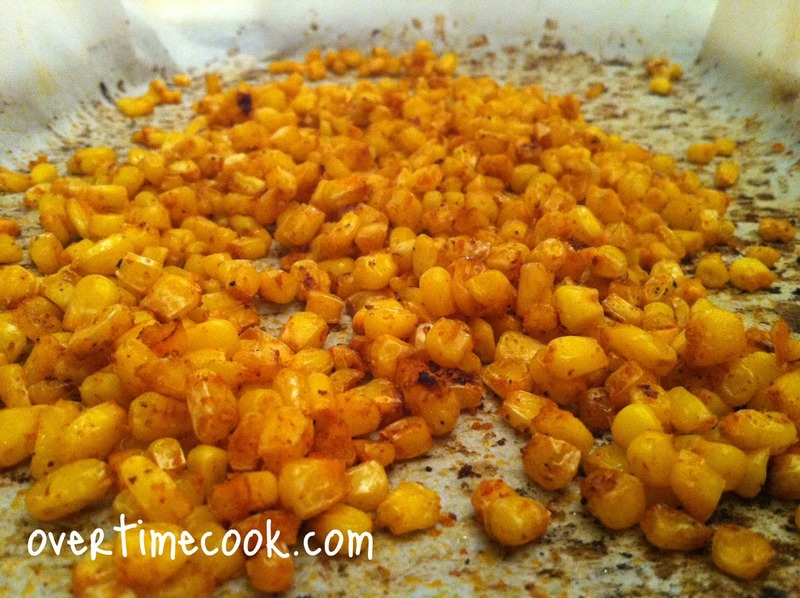 This is important, or the corn won’t get the delicious roasted texture. Bake at 400 degrees for 20-30 minutes, depending on how well done you like it. Watch it carefully towards the end, because this goes from “oh yum” to “ohmygosh it’s burnt” very quickly. This is delicious hot, straight from the oven, but is actually also delicious cold. It’s a starchy vegetable. I think of it as something in between a starch and a vegetable. And if you are looking for a snack, this is a much lower calorie solution than most. I hope you are getting ahead of the backlog at work. This corn looks delicious and would be great for anyone, dieter or not. Can I do this with canned corn? You might have to bake it a drop longer because of the extra moisture. 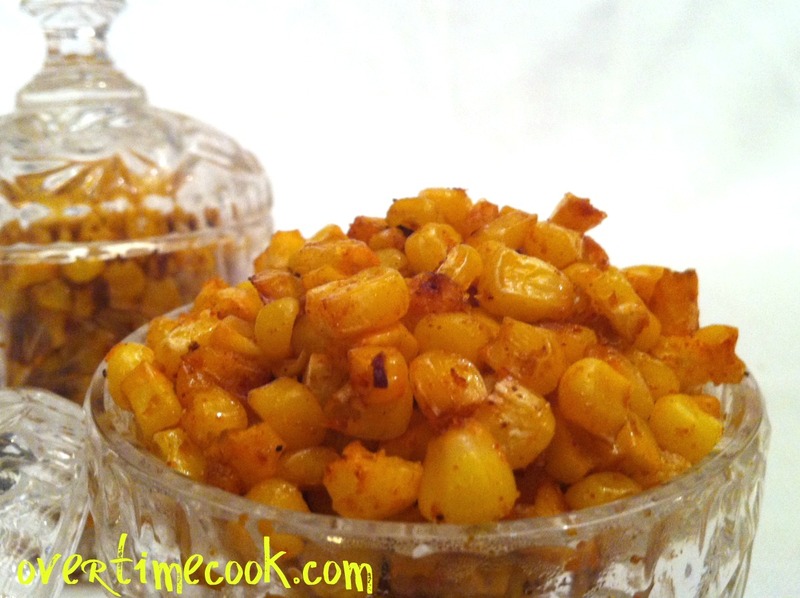 What a great idea to prepare corn that ways, I like this a lot, sounds delicious. Looks yummy, but is this like a corn side dish (soft texture), or is it like those crunchy corn things that go in snack mix? Funny you ask- it can be anywhere between the two, depending on how long you bake it, as well as how flat they are laid out on the tray. A single layer baked a little longer won’t be crunchy but will be an amazingly fun and yummy texture. I know just how you feel! I made granola last night to start having as a topping for yogurt but this looks great for those evening lulls. Wow – this is amazing! I LOVE it! Honey Bunny is ALL about corn, so this is right up his alley!